For more than a century, every J.W. Hulme Co. travel bag, briefcase, backpack, handbag, and accessory has been proudly Made in America and crafted to last a lifetime. 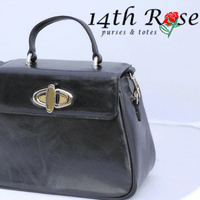 14th Rose Purses are a twist on the classics to take you stylishly from one season to the next. Our materials come from Maine first, New England second and USA third. We use the last remaining thread manufacturer in the U.S. We use the only rope manufacturer in New England. And our sail supply chain? Well, that’s as local as it gets. We collect our sails one at a time through a network of passionate boaters who love our community waters as much as we do. Inspired by the creative energy of our city, urban cycling and an intense desire to make great products, we started Rickshaw to satisfy our own personal passion for bags. We know how people love their bags. We think it’s cool–if not kind of weird–the way people grow attached to their favorite bag as though it were a pet or loved–one. If you make or sell American made bags, handbags, backpacks, luggage, wallets, purses, etc… and would like us to feature your business on this page, fill out our application and a MAM rep will respond within 48hrs.